In the 2018 edition of Hezbollah, first published in 2007, Boston University professor Augustus Richard Norton adds new chapters on the complex dynamics of the Syrian war involving the United States, Saudi Arabia, Israel, Russia, Iran, and the Shi’a militant organization, Hezbollah, the primary focus of the book. 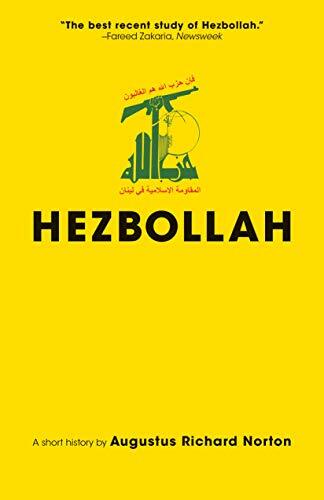 In all versions, most chapters tell the story of Hezbollah as a formidable force that shapes the power politics, the sectarian politics, and the war politics of the Middle East. Various nations and organizations, including the United States, Israel, Canada, the Arab League, and the Gulf Cooperation Council have declared Hezbollah a “terrorist organization.” Many “terrorism experts” paint Hezbollah as a villainous subsidiary of Iran determined to destroy Israel. There is much more to Hezbollah than its propagandized terrorist visage. Professor Norton explores the origin, efficacy, terror, and politics of Hezbollah from a factual-analytical perspective, empowering the readers to make their own ideological judgments. A multidimensional understanding of Hezbollah provides policymakers more insightful options and intelligent responses. This is perhaps the book’s crowning achievement. As an informative technique, Norton’s book traces the evolution of Hezbollah over a period of 35 years since its establishment in the early 1980s from a military resistance force against the Israeli occupation of southern Lebanon to a political party allowed to contest elections and be part of the Lebanese government. However, its highly effective military wing continues to delineate Hezbollah much more than a political party or a provider of social services. Hezbollah’s militancy rattles the Middle East, particularly Israel. And its close nexus with Shi’a Iran turns Hezbollah into an international threat, particularly for the regional Sunni nations. As the book elucidates, Lebanon is a confessional montage of discrete communities comprised of, among others, Maronites, Greek Orthodox, Greek Catholics, Druze, Shi’a Muslims, and Sunni Muslims. After the civil war (1975–1990), the Muslim-Christian “seat equality” in the parliament has been etched into the national constitution, even though Muslims constitute over 60% of the population. To further reflect the sectarian cartography, the political agreements require that the president of Lebanon be a Maronite Christian, the prime minister a Sunni Muslim, and the Speaker of the House a Shi’a Muslim. To contextualize the rise of Hezbollah, Professor Norton explains the mutual distrust of Lebanese communities. On paper, Lebanon “has an Arab identity and belonging,” is a member of the Arab League, and Arabic is the official national language. Nevertheless, the Muslim-Christian divide is more intense than the Arab unity and the Shi’a-Sunni divide is more passionate than the Muslim unity. Since 1948, the presence of Palestinian refugees has further complicated the sociopolitical undercurrents. Periodically, the massacres and political murders jolt the Lebanese communities into existential distress, frustrating the dreams of Arab unity and Muslim unity. In times of intense conflict, Sunni Muslims woo Saudi Arabia and the Gulf States, Shi’a Muslims seek help from Syria and Iran, and the Christians of all denominations lean toward the West. Even the punitive military interventions of Israel, a southern neighbor, divide rather than unite the Lebanese communities. Known for its Shi’a identity, Hezbollah is not a unifying force either for Lebanon or for the Middle East. Its close ideological ties with Shi’a Iran, a non-Arab nation, demonstrates that the Shi’a unity supersedes the Arab unity. Saudi Arabia, the primary foe of Iran, treats Hezbollah as an enemy organization that promotes the Iranian interests in the region. Likewise, Israel, which receives threats and rockets from the Hezbollah controlled areas in Lebanon, shares with Saudi Arabia a common objective of dismantling Hezbollah. Israel has greatly benefitted from the Shi’a-Sunni conflict within the Arab communities. Saudi Arabi, Egypt, Jordan, United Arab Emirates, and other Arab Sunni governments prefer an alliance with Israel than with Iran or Hezbollah. While the Arab Sunni governments have mostly abandoned the cause of Palestinians, Shi’a Iran and Shi’a Hezbollah continue to talk about “wiping out” Israel from the map. In the Middle East, the Arab-Jewish clash is fast turning into a Shi’a-Jew confrontation. In the Syrian civil war, the Arab Sunni governments are striving hard to overthrow the Alawite (a Shi’a offshoot) regime of Bashar Assad and restore a Sunni government. Driven by the Shi’a-Sunni dynamics, Hezbollah and Iran support the Assad government. By the compulsion of geopolitical logic, Israel and the United States oppose the Assad-Iran-Hezbollah nexus. This logic brings the Arab Sunni governments closer to Israel. Professor Norton rightfully composes the complexity of the Syrian war by examining the Russian intervention on behalf of Assad and the Turkish reservations about the Kurds in Syria, Iraq, and Turkey seeking an independent state. The most captivating chapter of the book appraises “ritual, identity, and politics” of Hezbollah. Historically, the Shi’a ethos is deeply rooted in the 680 CE genocide of the Prophet’s family—men, women, and children—exterminated by indiscriminate showering of arrows, beheadings, and denial of water in the scorching desert of Karbala, Iraq. Each year, the Hezbollah followers, dressed in black, commemorate the tragedy of Karbala with tears, wailing, and self-wounding. This commemoration is global among the Shi’a with varying degrees of self-wounding, though prohibited by Shi’a scholars. Professor Norton concludes his book with a quote from Hasan Nasrullah, the Hezbollah leader: “We don’t possess second citizenship, we were born here, we will die here and we will be buried here.” The extinction of Hezbollah seems unlikely to the author who, addressing the U.S., Israel, and Saudi Arabia, advocates “compromise.” Unfortunately, the compromise the author advocates is a remote possibility when compared to another deadly war between Israel and Hezbollah. For more than a decade, the book has been a luminous guide for students, teachers, and general readers interested in the Middle East. It is likely to remain so in years to come. The third edition captures even more nuances of Hezbollah as a central player in the war politics and geopolitical dynamics of the region.